Before you can run postcards for your patients, you will need to confirm the postcard form is active. To do this, go to the References ability, then select the Forms node in your sidebar. Under the Forms node, select the Postcard form and check the box next to Form Active. The Postcard form is now ready to be used. Next you will want to default the postcard form so it will automatically come up when you create a postcard. 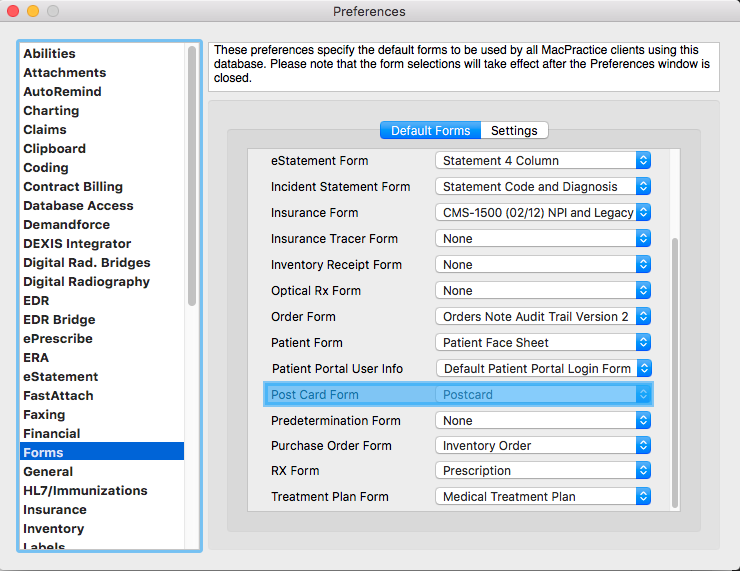 Go to Preferences and select the Forms panel. Select the enabled Postcard form under the Default Post Card Form menu and exit the Preferences to save the setting. With the Postcard form enabled and defaulted you are ready to create your postcards for your patients. Postcards can be created in the Schedule Ability or with the Recall Report (in DDS) or Follow-up Report (in MD, 20/20, and DC) in the Marketing Reports node. If you wish to run your Postcards for your patients from the Schedule ability you will need to first locate the patients you wish to create a postcard for. This can be done by selecting a date range or month in the small calendar. With the date range or month range selected in your Schedule sidebar, you will see all the patients with a recall entered for this month under the Recall/Follow-up node. Go to the Forms node (located directly below the Recall node). Under the Forms node you will see the Postcard form. Select the Recall node, dragging this down to the Postcard form. When you drop the Recall node over the Postcard, the postcard format window will appear to the right. This is the area where you can modify, add comments, and change the date format of your Postcard before you print this information. After confirming all is as you need click the OK button; your print window will appear so you can select your desired printer, printer tray and so on.. Click Print to finish your Postcard creation. If you wish to run your Postcards from your Recall Report, you will need to go to the Report ability >> Marketing >> Recall Report. Select your filters, date range, and search criteria then click the Apply button to get your list of patients. After confirming the list of patients you are creating a Postcard for click the 'Print Post Cards' button. The postcard format window will appear. This is the area where you can modify, add comments, and change the date format of your postcard before you print this information. After confirming all is as you need click the OK button; your print window will appear so you can select your desired printer, printer tray and so on. Click Print to finish your Postcard creation. If you have AutoRemind active on your license and have the option enabled on AutoRemind's side, you can utilize The Follow Ups/Recalls report to send Recall or Follow-up reminders to patients. Add a Follow-up or Recall: Before AutoRemind Recall Notifications can be sent, enter a Recall or Follow-up in the patient's record. The Recall / Follow-up topic demonstrates how recalls work within MacPractice. Set the Preferred Recall Method: After the patient has a recall or follow-up listed, set the Preferred Recall Method pop-up menu to the AutoRemind Notification Profile. You can set this for an Account by navigating to the Patients Ability > Patient Tab > Communication sub-tab. Information on patient account setup for AutoRemind is available in Patient - Reminders. Send Recall Reminders: Use the Follow-up or Recall Report to send reminders to patients. Note: In order to Send Recalls, you must have a default postcard form set in Preferences > Forms. Run the report, then click the Send Recalls button. From the resulting window outlining the number of each recall type to be sent, enter a comment to be printed on the post cards if paper reminders are also sent. Click the OK button to generate the AutoRemind electronic messages and print any post cards. AutoRemind recommends running this report for a month date range at least twice per month. This will send an additional reminder to patients that have not yet scheduled an appointment. If you do not see the drop downs by "Emails", "SMS", "Voice" and "Postcards" at the top of this screenshot above, you may not have the AutoRemind Follow-Up/Recalls feature active. Please contact AutoRemind to discuss purchasing this option. Schedule Recall appointments: When an appointment is scheduled, link the appointment to the Recall or Follow-up to ensure that the Recall or Follow-up Report will not generate duplicate reminders for patients that have scheduled an appointment.